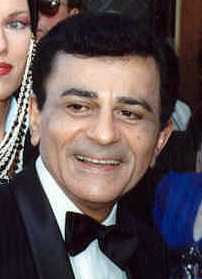 Ba aisteoir Meiriceánach é Kemal Amin "Casey" Kasem a rugadh ar an 27 Aibreán 1932 in Detroit, Michigan. Fuair sé bás ar 15 Meitheamh 2014. Staraí ceoil, fuirseoir, amhránaí agus pearsa radió a bhí ann freisin. Grósaeirí a thuismitheoirí agus é ag fás aníos. D'fhreastail sé ar Ollscoil Wayne State. Nuair a bhí air a sheirbhís míleata a chur isteach in Arm na Stát Aontaithe sna luath-1950idí, d'oibrigh Kasem mar láithreoir ar Armed Services Radio sa Chóiré. D'oibrigh sé do roinnt stáisiúin raidió i Michigan, California, agus áiteanna eile. Aithnítear é mar gheall ar an nguthú a rinne sé ar pháirt Shaggy sa tsraith Scooby-Doo!. Sa bhliain 2009, d'éirigh sé as an chuid is mó den obair sin mar gheall ar an néaltrú coirpíní Lewy (tinneas atá cosúil le galar Parkinson) a bheith ag éirí go trom air. Ról guthaithe amháin sa bhliain 2010 an obair dheireanach leis, agus é ag déanamh guth athar Shaggy ar an tsraith theilifíse Scooby-Doo! Mystery Incorporated. Chuir cúirt é faoi chúram iníne leis, Kerri Kasem. Is de shliocht Liobánach é agus is de chúlra Drúsach a mhuintir. Bhíodh sé gníomhúil in eagraíochtaí Liobánacha agus Arabacha sna Stáit Aontaithe. ↑ Kasem, Julie; Kasem, Kerri; Martin, Troy (2014-05-13). CNN Tonight. Interview with Bill Weir. CNN. ↑ ainm=CNS051214>"Casey Kasem’s daughter named temporary conservator for father". Archived from the original on 12 Bealtaine 2014. Tugadh an leathanach seo cothrom le dáta an 15 Meitheamh 2014 ag 23:10.